Iceland. You know it has ice, but what else? The vast glaciers, powerful waterfalls, winding fjords, and volcanic flavor create a striking landscape unlike any other. Iceland is almost overflowing with natural wonders, which is why we collected the best of the outdoor activities to help you enjoy incredible Iceland to the max. Read on to find out how the “Land of Fire and Ice” exhibits nature’s forces in the best way possible. The landscape has been compared to the Alps, but years of various natural forces, like volcanic eruptions and glacial floods, have sculpted Vatnajokull National Park into a style all its own. 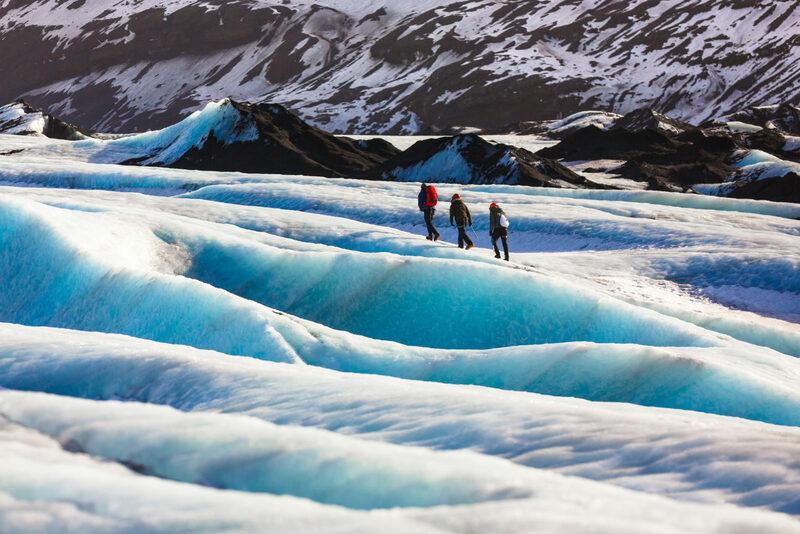 Adventure lovers and outdoor beginners can glacier hike across the icy expanse of the Vatnajokull glacier, Europe’s largest glacier, for stunning views of the surrounding snow-topped peaks. Ice climbing in the huge cracks and crevasses provide rugged exploration. The park’s unique nature and significant history earned it a UNESCO World Heritage label. See the place where the Icelanders founded their parliament in 930 A.D. 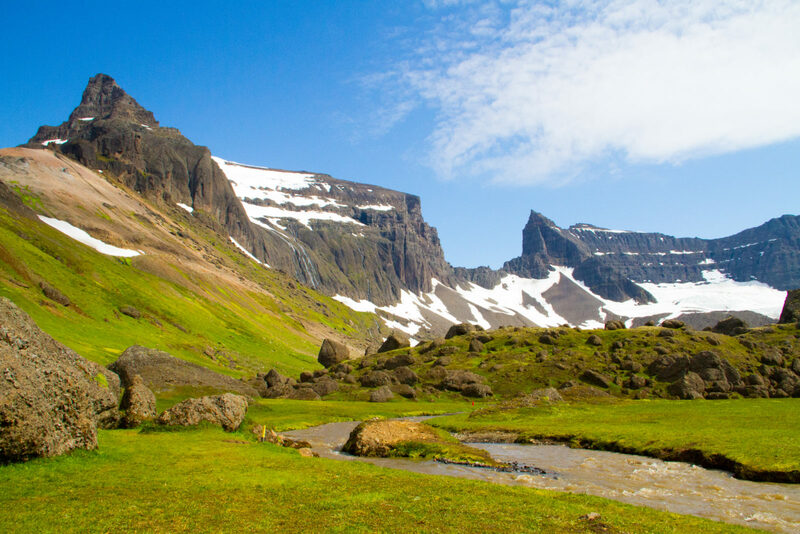 Within the park, the area of Skaftafell hosts even more breathtaking mountains and a glacier of the same name. Further towards the coast, you’ll find the jagged icebergs scattered in the Jokulsarlon glacial lagoon. If you want to spend your whole day in Iceland’s finest nature, look no further. 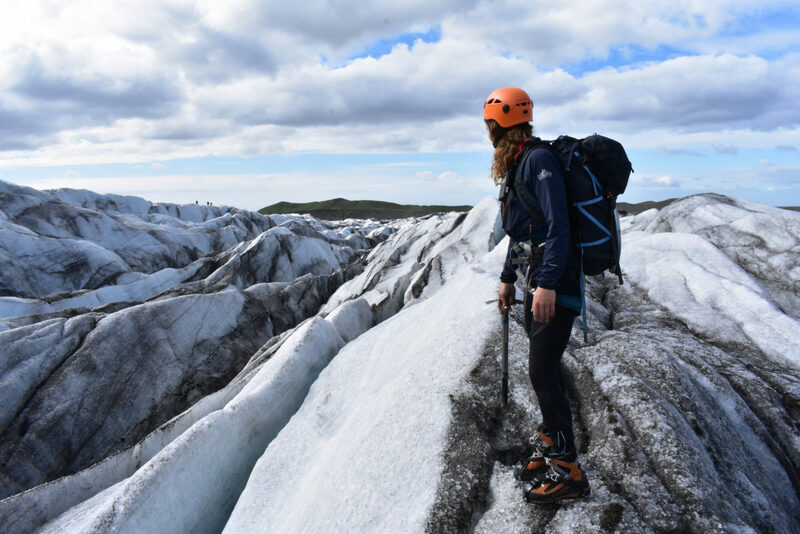 Iceland’s fourth largest and most accessible glacier welcomes everyone from the beginner hiker to the ice enthusiast. Solheimajokull Glacier’s sloping landscape of bright white and blue ice is nothing short of spectacular. The jagged ice formations and cracks create a frozen wonderland among the mountain tops. Take a guided trek across this glorious glacier with a guide to ensure you use trek safely and securely. The beauty of the Vatnajokull glacier only gets better under the surface. The high pressure of the ice creates a pure blue color, making the ice cave an incredibly colorful journey. The cave below changes every winter as the glacier moves and refreezes along the mountain. Ice sculptures hang from the ceiling, and slanted walls of ice create an otherworldly sensation. 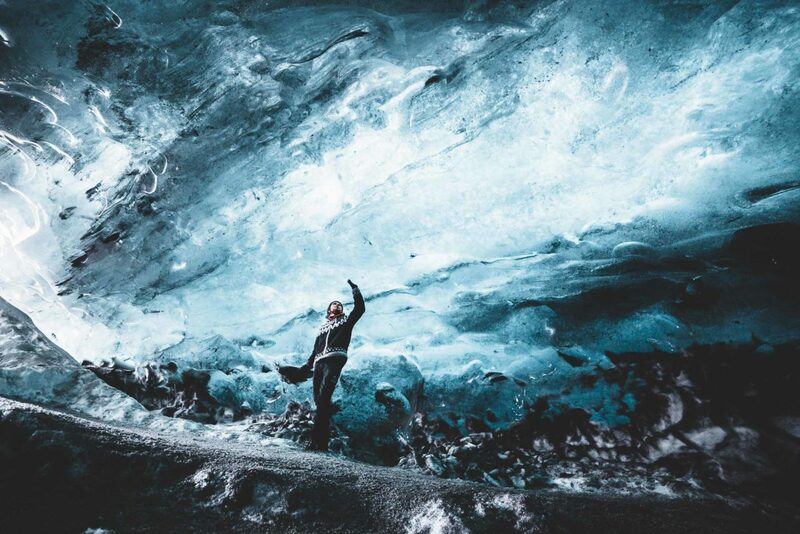 Wander through this glacier to explore a rare natural phenomenon. It’s a whole blue world. There’s a certain novelty about standing in two places at once – but have you ever swam in two places at once? 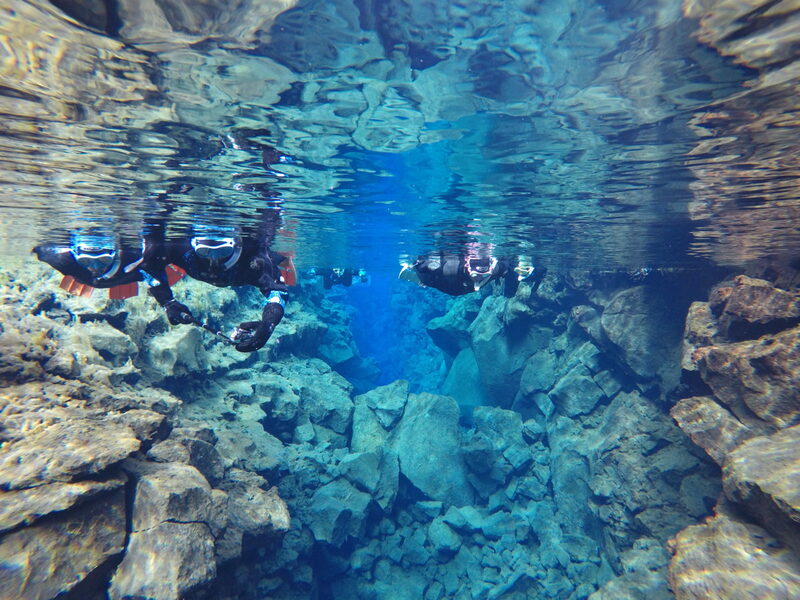 The Silfra Fissure is a crack in the earth’s crust where the North American and Eurasian tectonic plates are slowly moving away from each other. Due to its 30-100 years of natural filtration in a porous lava field, the water flowing through the fissure is light, pure, and delicious to drink. The incredible visibility reaching more than 100 m (330 ft) allows snorkelers and divers to admire the rocky walls of the canyon and the algae of the shallow lagoon. Pull on your dry suit before jumping into the 2°C (36°F) waters and swim from Europe to America in just a few flips of your fins. The summer weather is wonderful in Iceland, and Atlantic puffins think so too. These small seabirds come to Iceland to nest in the warmer months, keeping their 8-10 million population in Iceland stronger than ever. There are plenty of spots along the coast to spot the black and white birds, but the months to go are May-September. 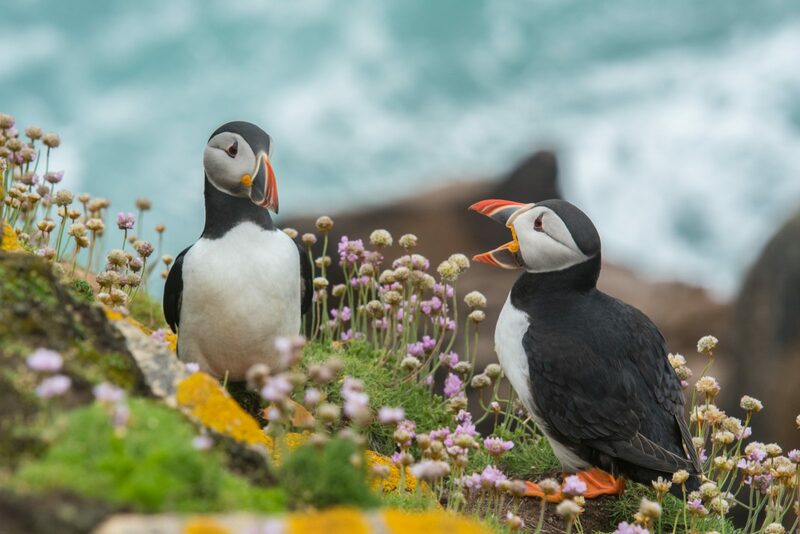 Venture to the small island Akurey near Reykjavik, Lundey (literally “Puffin Island”), or Vestmannaeyjar, a cluster of 15 islands, to witness the monogamous pairs taking care of the eggs or fishing for food. Iceland has the perfect formula for waterfalls: a hilly landscape + frequent rain and snow + summertime melting glaciers. Because of all the flowing water, these picturesque settings are also quite powerful. With so many waterfalls in the country, it’s hard to recommend to all of them. Here are a few of the most impressive for you to put on your list. 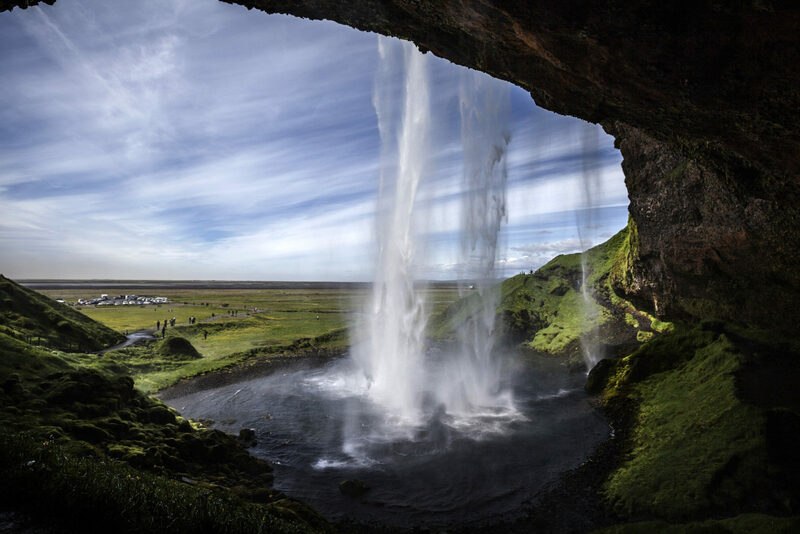 Skogafoss – As one of the biggest waterfalls in the country, the 60 m (200 ft) tall powerhouse is quite the spectacle. Hike up alongside Skogafoss to get fantastic views and a little spray of the mist. Dettifoss – Known as the most powerful waterfall in Europe, Dettifoss tumbles down 500 cubic meters of water per second. Feel the vibrations and listen to the rush of the massive water flow at this impressive fall. Seljalandsfoss – Tumbling down a 65 m (213 ft) height, Seljalandsfoss is most known for the spectacular views from behind the water. Put on your raincoat and walk behind the waterfall to get your photos and see from a new point of view. 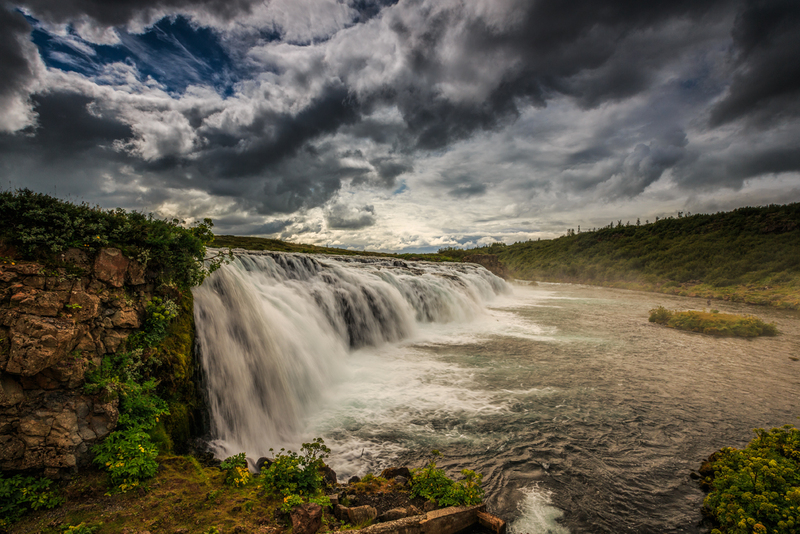 Gullfoss – Gullfoss may be the most visited waterfall, but it’s for good reason. The water cascades down two stages before falling through a 70 m (230 ft) canyon. Join the onlookers on a sunny day and marvel at the numerous rainbows appearing in the mist. This popular route through Iceland brings you to some of the best sites in the country. Along the 300 km (186 mi) loop, you see the site of Iceland’s first parliament in the 10th century in Thingvellir National Park, a UNESCO World Heritage site. Next, walk through the geothermal area in Haukadalur, containing the geysers Geysir and Strokkur, to see mother nature’s force at work. The mighty Gullfoss waterfall also makes the list, displaying a frozen spectacle in winter and thousands of rainbows on sunny days. Hit the route for a full day of Icelandic discovery in one convenient trail. The active volcanic history has made its mark on all parts of Iceland, including the coasts. 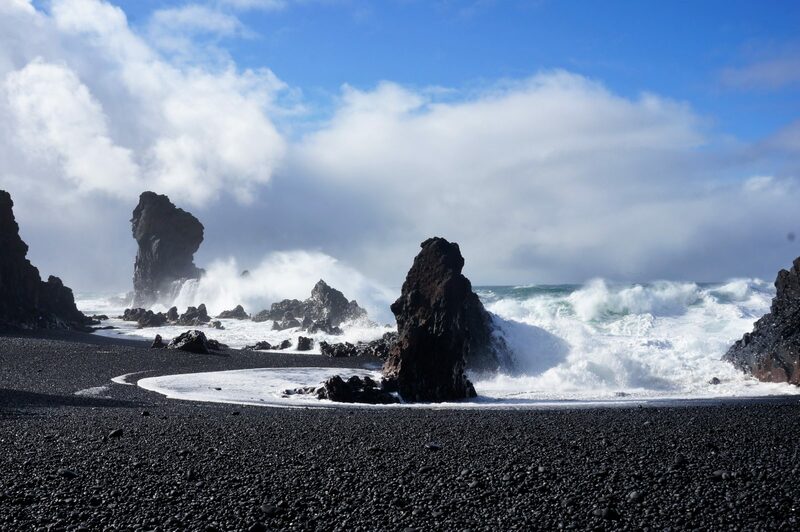 Walk along the Djupalonssandur beach to admire intricate lava formations and black pebbles. Within this former fishing station, four large stones of varying weights were used a long time ago to test a man’s strength; those too weak to lift were labeled “unsuitable” for the fishing life. At another lava sand beach named Reynisfjara, tall basalt columns poke out from the strong Atlantic waves. Walk to the nearby cave and admire the geometric rocks forming the entrance. As far as drama goes, geysers are Mother Nature’s show of theatrics. 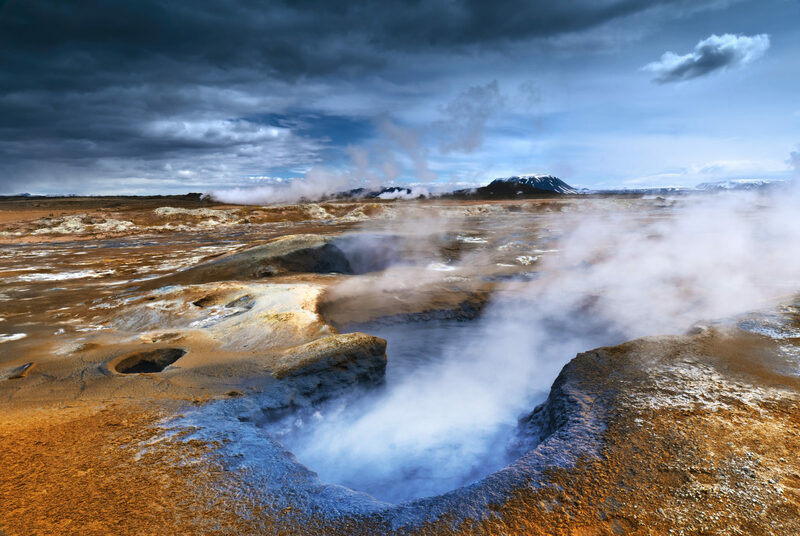 These vents in the Earth’s surface periodically thrust hot water and steam up into the air. The Great Geysir in the southwest is the first recorded geyser in history, and it’s where all the other geysers get their name. The Icelandic word “geysa” means “to gush,” making it quite appropriate. 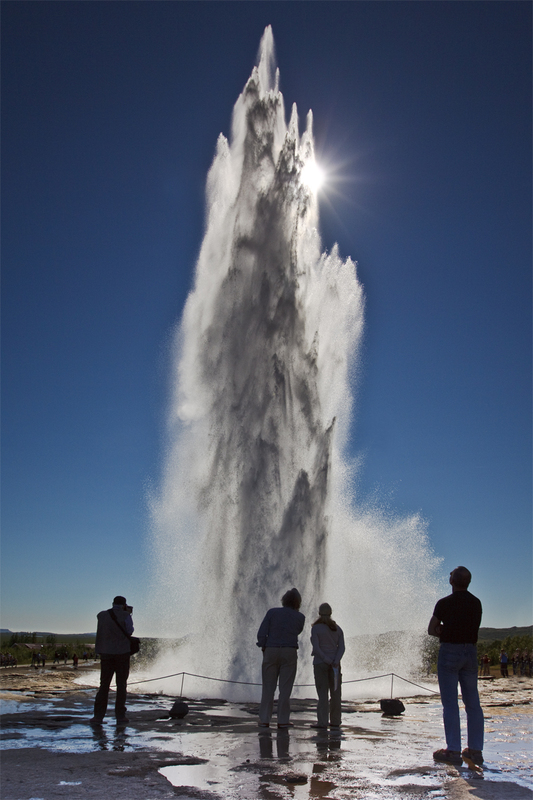 While the Great Geysir does not erupt too often, you can admire the Strokkur Geysir as it erupts every few minutes. There’s also plenty more waterworks around the country waiting for an audience. In old times, people believed hell to be under volcanoes and anything steaming. While a through the Krafla Caldera is otherworldly, it’s also a very beautiful, calm experience. This 10km long, 2km deep area (6mi, 1mi) is a collapsed but active volcano. The area is filled with geological interest, with three main areas attracting the most eyes. Hosting a peaceful teal green lake in its center, you can walk along the 30 km (19 mi) at the top of the ridge of the Viti Crater (one of 2 with the same name). Step around steaming rocks and pale abstract patterns in the Leirhnjúkur Lava Fields. You can also visit the geothermal Krafla Power Station, where the underground forces are transformed into energy for the locals. Not far from Krafla, Lake Myvatn and the surrounding area grassy meadows and lava field offer even more volcanic beauty to admire. Walk around the lake and be sure to dodge the bubbling mud pools! When you’re up this close to the Earth’s pole, you’re one step closer in witnessing nature’s electrically charged show of lights. 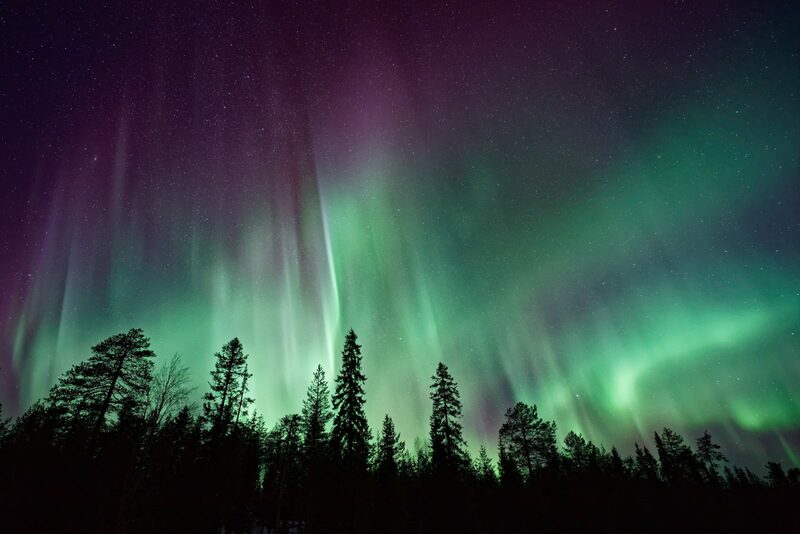 When charged particles from the sun collide with the gases in the Earth’s atmosphere, the fantastic “Aurora borealis” forms. Pale green and pink ripple through the sky in shooting rays, with the occasional streak of blue, red, or violet. To increase your chances of spotting this famous spectacle, visit Iceland in the winter and join an expert guide who knows the perfect “hunting” locations. Keep your fingers crossed and hope that Mother Nature feels like putting on a show. Nicknamed “Iceland in Miniature,” the Snaefellsnes Peninsula is 90km (56 mi) of natural marvels. Situated in the west, this dramatically beautiful area easily fills a day of sightseeing and exploring. The highlights of the peninsula include the mighty Snaefellsjökull stratovolcano, topped with a glacier, in the middle of the Snaefellsjökull National Park. Iceland’s ideal combination of cold and warm waters and abundant summer sunshine make the surrounding seas a migrating whale’s mecca. With all the krill and fish swimming around, 23 species of whales make their way up to Iceland to feed. 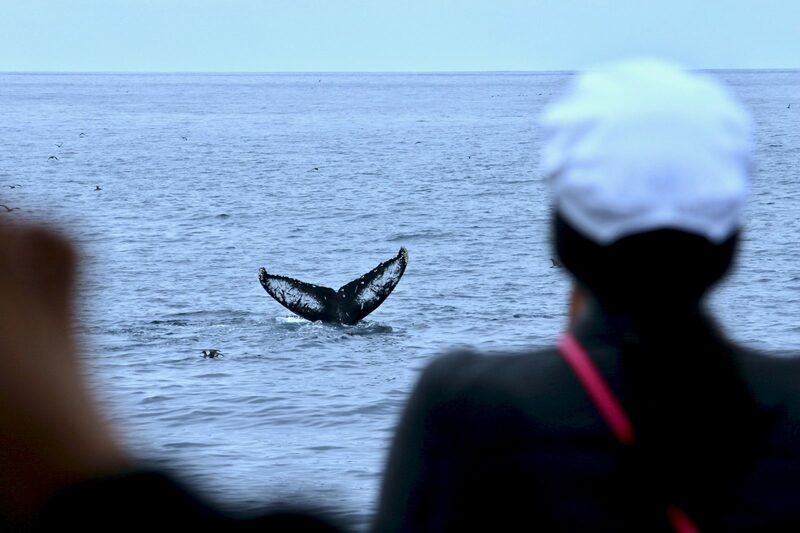 On a whale watching expedition, you may spot a humpback whale slapping its tail or a harbor porpoise speeding along the surface. From the big to the small, admiring these magnificent water mammals is a true treasure. If the frenzy of visitors in popular west Iceland gets too much, venture to the opposite side of the island for more serene yet just as gorgeous scenery. 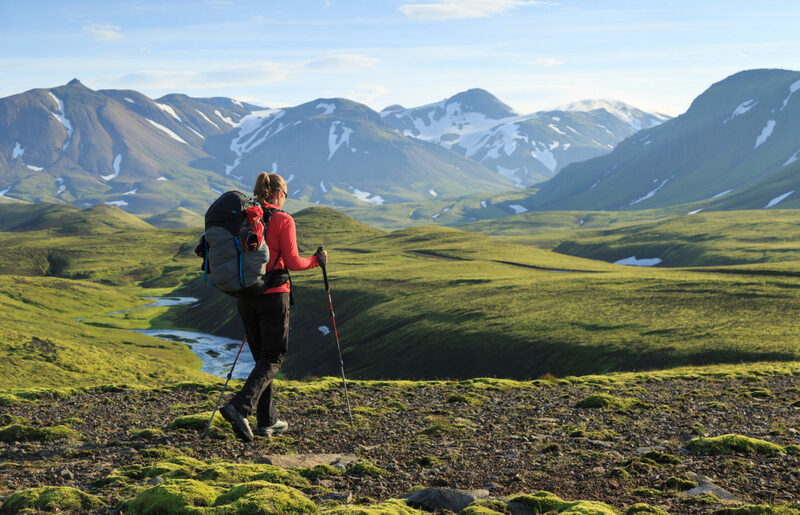 The Dyrfjöll mountains near the coast reach up to 1, 136 m (3,727 ft) high and provide some of the country’s most breathtaking hiking trails. Just below these snow-capped peaks, the area of Storurd’s giant boulders, icy ponds, and tumbling meadows make it a natural playground. You can easily spend your day admiring the lush landscape, tall mountains, and turquoise waters of Storurd. Standing tall in Reykjavik is the iconic Hallgrímskirkja church. The Icelandic architect Gudjón Samúelsson designed the 74.5 m (245 ft) facade after Icelandic nature. The expressionist style mimics the volcanic rocks, mountains, and glaciers of the landscape. Climbing to the top of the church brings you to unbeatable views of Reykjavik and the surrounding mountains. 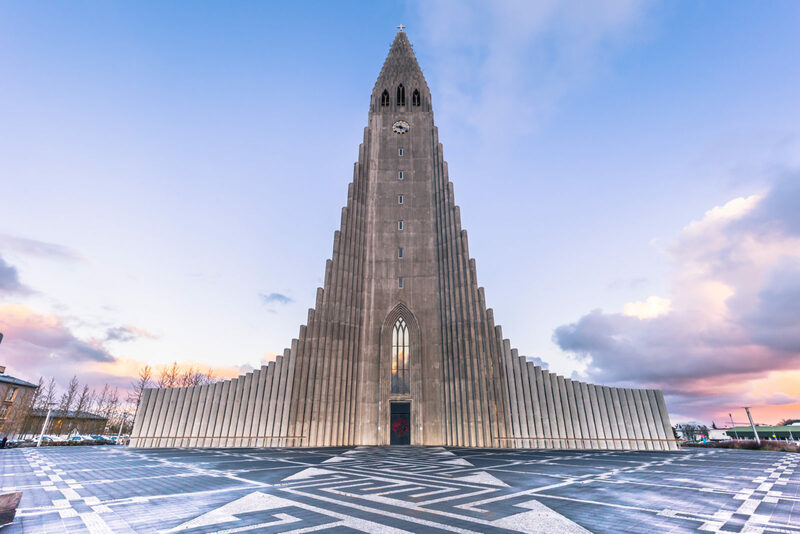 It may be the tallest church in Iceland, but it’s unique style certainly makes it the most memorable too. 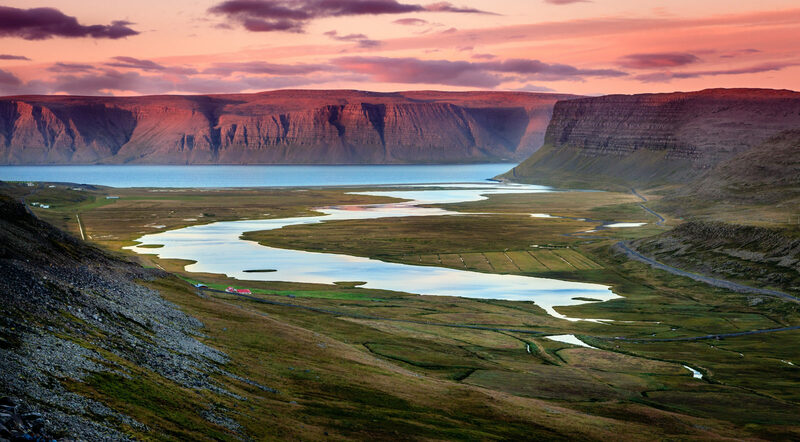 High up in the northwest of Iceland, the mountainous Westfjords hosts a number of natural marvels and all ranges of wildlife. The 441 m high Latrabjarg Cliffs steal the show with their immense size and millions of birds. Literally. Puffins, razorbills, and guillemots are just a few of the 80 species inhabiting the area. The Hornstrandir Nature Reserve and it’s rolling green expanses and intricate fjords is a protected area of unfathomable beauty for those seeking untouched nature. After hiking through the reserve, be sure not to miss Raudasandur Beach, where pulverized scallop shells have accumulated into a reddish pink sand. Known as the “Jewel of the Westfjords,” the Dynjandi waterfall dominates a rugged rock wall with 6 cascading layers.